85% of juveniles who interface with the court system in the United States are functionally illiterate. More than 70% of the over 2 million people currently incarcerated read below a fourth grade level. Individuals who improve their ability to read have only a 16% chance of returning to prison compared to a 70% return rate if they don’t improve reading skills. There are prisons and jails in the United States with few to no books available. 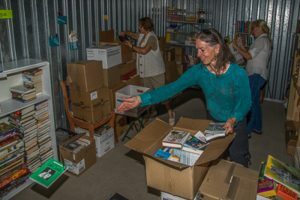 Since 2009, Books Inside has been putting books into prisons and jails across the country, in some cases starting libraries where none existed. What follows are excerpts from letters from an inmate, Adam, who has been receiving books from Books Inside for close to 2 years. We generally work directly with the facility creating or adding to libraries or book carts, however, Adam wrote directly to us. His full name, number, and facility are not included. I came across your address and would like to be considered for the chance to receive some books. I would also like to say that I appreciate what your organization does for us . … I enjoy reading suspense, horror, military, Native American, seafaring accounts, and puzzles. Thank you for your letter. Books Inside generally sends books to prison and jail libraries rather than to individuals. Almost all of our books are donated. Do you have a library at your facility? … I’ve been thinking about your request, and we certainly can send you a few books if that works at your location. Also please let the library there know that we can send them books as well. Thank you for answering my letter and explaining what you guys are all about. … Yes, we do have a library here at __ . To be perfectly honest it’s actually a pretty decent library. You can’t browse the aisle personally, you have to request the book and then they go back and get it for you. Much like an auto parts store. So my problem is that certain parts of the unit are designated a day and one hr. to go to the library. These days all fall on week days. I’m a full-time student and if you miss a class in here you’re punished. So I must miss out on our library day due to my schedule . … I am a voracious reader . … Trust me Toby whatever you want to send me I will read! [VOICE OVER: Last year we placed over 23,000 books in boxes of about 50. Why don’t we give it a try? We can send Adam a box of the 5-6 he’s allowed to receive with an introductory letter. Photo from Books Inside website. First I would like to start off by saying “Thank you everyone for your help and generosity.” I will definitely pass along your offer to the library … by including a note when I donate the first of the books that I finish. … Oh! If you happen to come across a Scrabble 5th edition dictionary, we all on this wing would greatly appreciate it. They allow us to use the game but there’s no dict. most of the time. Hello Toby and Books Inside volunteers! That almost sounds like Capt. America and the Avengers. Hm? Instead of fighting villains andworld doom, you help fight boredom and mind stagnation! … I will say that the second box came in very handy, as we were on lockdown which consists of sack meals and cell confinement. I learn, I am able to leave the confines of my cell and soar past the razor wire to places I may never see but can vividly picture in my mind. I could carry on a conversation with a world traveler and he or she would be none the wiser. All because of books. That’s my answer to your slogan. *Graduated my first vocational course and will begin the next one as soon as up from lockdown. How goes it fellow bookworms!?! … P.S. Do you come across many nature books? I.E. Animals or adventures in the wild? If it’s not too much trouble could that be something for future ideas for books? Thanks so much for your time! …. Yes, we do get quite a few animal and nature books. The “bookroom” where the books stay until they’re sent off to their locations, is set up as a small library–shelved by topic, e.g. fiction, non-fiction, mystery, sci-fi, fantasy, self-help, foreign language, and western. This makes it easy to send boxes of the type of books that each jail we work with wants. Happy to send you books on nature and animals! …. I just finished Carpentry and am now waiting for Cabinet Making. I like working with my hands, always have. In the free world I worked at a marina doing bottom jobs and fiberglass repair, plus woodwork mostly with teak …. Thanks for making some guys in __ , time a little easier. …. A good book becomes a great friend in here … These aren’t just books but tools for learning and keeping the mind sharp …. …. These books have spread out to help others around me spend their time in a productive manner … I really enjoy the crossword puzzles. Thanks for remembering! …. It is kind of funny how I went from doling out books from you and the volunteers to my own little swap n’ shop!! … Just out of curiosity what do you do with all the books that can’t really be used, i.e. old textbooks and such? Have you thought of recycling said books? Yes, we do recycle any books that we don’t have a place for, however, as we work with more places, we’re finding that we can use almost everything. In some locations, parents read to their children either over the phone or on visits making children’s picture books helpful. Easy reads and those for young adults are especially good for people who have difficulty reading or for whom English is a second language. Places that have an emphasis on education can use textbooks and one facility asked us for only foreign language. Recently we’ve talked to a work camp that has had a great deal of trouble locating books on the “trades.” This is a new request for us and we definitely can fill the order! P.S. I appreciate you’re thinking about recycling. It’s important to us as well. …. I’ve done the smart thing and brought in a helper. Our cells are only so big so now he keeps some books over there while lending, trading and maintaining our stack of books for our wing. …. So if you’re wondering why I’m writing a bit early. Seems I’ve gotten myself in a bit of a pickle! These things happen from time to time. So I’m currently on lock-up! Yes the jail in the jail! I’m holding up, not sure how long I’ll be back here … You lose certain privileges but your correspondence and books you get to keep. For that I’m thankful! …. There’s something to be gleaned from all of life’s situations. Maybe I’m being contemplative right now cause I’m in “jail” but it’s good to reflect on thoughts, plus I find writing them down to almost be a release of frustrations or just things going through my head at the time. …. That’s the cool thing, books aren’t just a one time deal, they hold their stories and adventures for the next person to enjoy. One book can entertain hundreds! So the ripple effect is very much alive with B.I. …. There’s no way for me to keep all the books sent to me without getting tagged as a fire hazard. But I can make sure the guys who do help me in this are mindful that these books are to be enjoyed by those who want to read them yes, but also just as importantly respect them and take care of them so the next reader can enjoy it just as they did. To date this has happened … Yes, we do want to “leave” here for periods of time. Reading is a great way. Plus when it’s a really good book you also pass time, our enemy in here. Weird huh? … Out in the free-world there’s never enough time, in here there’s too much time … Just to put everything in perspective and focus on the positives in my life not dwell on the negative. Reading certain books can do that. [VOICE OVER: In one letter Adam said that he recognized all that volunteers were doing on the project and said he wished he could help. He is helping! Books Inside’s objective is to get books into the hands of people in prison and he is doing just that. We consider him a B.I. volunteer and have the picture he sent us hanging at the bookroom. In one other location, a jail in Georgia, an inmate wrote to us, and we helped him set up a library with the support of the facility captain. They started with a small, empty room and a few worn romance novels. Over the many months they have received close to 1,000 books.] During the holidays, we sent Adam a holiday card with notes from our small group of volunteers. …. What started out as a simple request for books … well, I made new friends in the process!! We may not know each others’ stories but we all share a common thought! Books are many things … tools, history, drama, too many to list, the point is books are great, always have been, always will be. A great story will stand on its own, won’t go stale doesn’t run low on batteries or have to wait for downloading. A book is as slow or fast as the reader desires …. I am humbled by everyone’s kind words. I will continue to strive to do all I can to ensure that everyone’s work continues to be felt by others who enjoy the books.